Facing the swimming pool,the BLUE VIEW chalet is made of wood and stone. With an area of 120 m2,it has two bathrooms two bedrooms, a living room,an open kitchen. -Heating / air conditioning: each chalet is equipped with an air to water heat pump with underfloor heating and cooling and three adjustable convectors: one for each bedroom,one for the living room. -Facilities: the chalets are equipped with washing machine,dish washer,induction hot plate,oven, a combined refrigerator/freezer,a Smart TV 3D 107 cm,micro-waves oven,coffee maker and toaster. 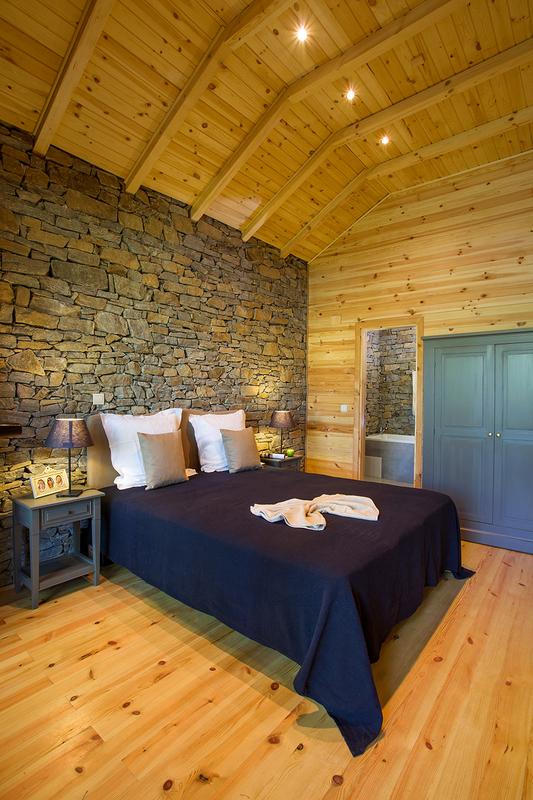 -Bedding: each chalet has a 07 sleeping capacity: a large bed 1.6 m x 2 m, three single beds of 0.8 x 2 m,sofa bed with 2 independent beds from 0.8 x 2 m - each bed is equipped with a mattress (springs) of French quality. -Bathrooms,WC: each chalet has two bathrooms -one with bathtub and shower space, the other with shower cabin- and two toilets.